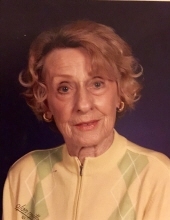 Marian Glenn Tison, age 88, passed away on Sunday, November 18, 2018 at Saline Care Nursing Center in Harrisburg, IL. She was born in Ottawa, IL on August 24, 1930 to Glenn R. Harris and Hazel (Flanery) Harris. In 1962, she married James R. Tison and he preceded her in death on April 21, 1987. Marian loved life and people everywhere. She was a homemaker, a member of the First Baptist Church in Harrisburg and a member of the illustrious Beta Sigma Phi sorority chapter. She is survived by her son Michael (Gloria) Tison and daughter Anmarie (Dale) Ascoli; grandchildren Alexander and Gabriella Tison; step-grandson Josh Ascoli, sister Jane Hannigan, brother Robert Harris, sister-in-law Rosalie Tison and numerous nieces and nephews. She was preceded in death by a son Daniel Holms, sister Joanne Aicher, brother John Harris and special friend Michael Herrin. Visitation will be at the First Presbyterian Church in Harrisburg on Saturday, November 24th from 10:00-11:30a.m. with the service immediately following. The Reverend Laurie Anne Fields will be conducting the service. Arrangements have been made by J.M Weirauch Funeral Home. If you desire, memorials may be made in Marian’s honor to the Christian Community Compassion Center or to Heaven’s Kitchen. To send flowers or a remembrance gift to the family of Marian G. Tison, please visit our Tribute Store. "Email Address" would like to share the life celebration of Marian G. Tison. Click on the "link" to go to share a favorite memory or leave a condolence message for the family.